In Greek mythology, Medusa was a winged woman with slithering snakes in place of strands of hair. All who gazed upon her monstrous face would turn to stone. A curious genetic disease strikes sufferers with a semblance of the horrible fate inflicted upon Medusa's victims. 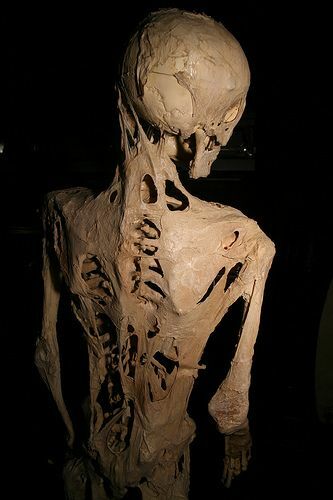 Fibrodysplasia ossificans progressiva (FOP) gradually turns fibrous tissues like muscles, tendons, and ligaments into bone. The genetic disorder afflicts fewer than one in two million people. As of 2017, only 800 confirmed cases have been identified. All of these patients share a near identical story: At birth, they emerged from the womb with mysteriously malformed big toes – short, stubby, and without a skin crease on account of the toe having only a single phalanx rather than the usual two. As infants, their lives progressed without much incident until between the ages of three and four, when the hallmark ossification, or bone growth, typically begins. Whether spontaneously or in the wake of some sort of physical trauma, lumps form around the neck accompanied by reddishness of the skin and occasionally bruising. Then, over a matter of months, the nearby muscles, tendons, and ligaments slowly harden, transforming to bone. The metamorphosis continues over the ensuing years, first striking the shoulders, then moving to the arms and chest, and finally progressing down to the legs and feet. By age thirty, almost all those afflicted with FOP are locked within cages of their own skeletons, often unable to move at all. By age forty, most die from complications related to the disease. While FOP was initially documented in the 17th century, most of our knowledge about the condition came on account of the experience of Harry Raymond Eastlack, Jr. Born in Philadelphia, Eastlack struggled with FOP since the age of four. Each year, he lost more and more mobility, eventually only having control over his eyes, tongue, and lips. Before dying of pneumonia at age 39, he expressed the fervent desire to donate his skeleton to science. It has now been displayed at the legendary Mütter Museum in the College of Physicians of Philadelphia for well over forty years, and is heavily utilized as a reference by researchers studying FOP. In 2006, some of those researchers led by Frederick Kaplan at the University of Pennsylvania pinpointed the precise gene responsible for causing FOP. ACVR1 is integral to bodily repair, but when mutated, the repair mechanism goes haywire. This explains one of FOP's most disturbing effects: any sort of trauma, from a knock on the thigh to the stab of a needle, can cause the surrounding tissue to slowly ossify. Early sufferers of the disease found this out the hard way. In the mid 20th century, surgeons would attempt to remove excess bone growth only to find the practice futile. Painfully, relentlessly, the bone always grew back, often leaving patients even more disabled than before their surgeries. Thankfully, expanded knowledge about FOP has helped modern-day sufferers live fuller, more meaningful lives. Carol Orzel was one such person. A fan of painting and fashion, she was able to pursue both of those interests throughout her life, even as bone growth gradually restricted her movements. Like Eastlack, Orzel was born in Philadelphia, and was passionate about taking part in medical research. Her selflessness helped scientists discover the genetic secrets of FOP. Now, several drugs to treat the condition are in clinical trials. She passed away last year at age 58, and this year was granted her dying wish: to have her rare skeleton displayed alongside Eastlack's at the Mütter Museum.